Judy Small is an Australian folk music legend. Her songs are sung all over the English-speaking world in concert halls, at political rallies and around campfires. After more than forty years in the music business she retired in 2013 when she was appointed as a judge of the Federal Circuit Court of Australia. Judy grew up in the small seaside town of Coffs Harbour in New South Wales, and was inspired as a youngster by the folk music boom of the 1960s. When she got her first guitar at fourteen years old, it wasn’t the Beatles or the Beach Boys she wanted to emulate: it was those big-voiced women like Joan Baez, Mary Travers (of Peter, Paul and Mary) and Judith Durham (of the Seekers), who sang songs about real people and real issues. Leaving her home town in 1972 when she moved to Sydney to study, she obtained a masters degree in psychology and over the next ten years she performed locally at folk clubs, wine bars and concerts, gaining a reputation as a powerful interpreter of both traditional and contemporary songs. Soon, she started writing her own material to fill gaps in her repertoire, when there weren’t songs already written which said what she wanted to say. Her first album, A Natural Selection, was released independently in 1982, the result of twelve months of fundraising by a group of Judy’s friends calling themselves ‘Good Things Enterprises’. She also burst onto the international stage in that year, playing at the Vancouver Folk Festival at the invitation of Eric Bogle. Shortly after, she left her public service job to take up the challenge of being a full-time singer-songwriter—from that point on, Judy went from strength to strength as an internationally acclaimed performer and recording artist. Over sixteen years she regularly toured in the US, Canada, the UK, Denmark, Australia and New Zealand. 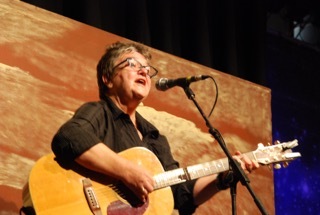 In 1990, Judy received the prestigious Mo Award for Australian Folk Performer of the Year, and in 1997 was the Port Fairy Folk Festival Artist of the Year. She was also invited to Beijing for the United Nations Women’s Conference NGO Forum in 1995, where she sang to thousands of women from all over the world. Judy’s songs have been recorded by artists such as Ronnie Gilbert, Eric Bogle, The McCalmans, The Corries, Charlie King and Priscilla Herdman, and several have been translated into a number of languages. She has released twelve albums, and has hundreds of songs and a songbook to her credit. In 1997, Judy cut back her performing schedule to take on the world of the law. She worked a family lawyer in Melbourne working in private practice and then for Victoria Legal Aid until she was appointed to the bench. She does not entirely rule out returning to music in some form when she retires from full time work.